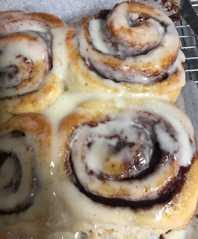 You'll never wish for a Cinnabon again after one bite of these! These easy to make, gooey Cinnamon Rolls strike the perfect balance of sweet, cinnamony and gooey. That'll be sure to have you and your family coming back for more! Grease and line a sheet pan with parchment. Combine Authentic Foods Steve's GF Bread Flour Blend, sugar, salt, and yeast in mixer bowl. In separate bowl whisk together eggs, melted butter, oil, and water. With mixer running with dough hook attachment gradually add liquids to dry mix. Scrape down bottom and sides and allow to mix on medium speed until smooth dough is formed. Remove dough from mixer bowl and knead lightly until smooth. Dust work surface well with rice flour, as well as top of dough. Roll out dough with rolling pin into a 15 inches x 20 inches rectangle with the widest end facing you. For the filling place softened butter in mixer bowl with paddle attachment. Begin mixing to soften and break up butter. In separate bowl sift and combine brown sugar, powdered sugar, cornstarch, cinnamon, and salt. With mixer running on low, add half of dry ingredients to butter gradually, followed by heavy cream, and lastly add remaining cinnamon sugar mixture. Mix until smooth and evenly combined. Dust any remaining flour off of dough after rolling out and spread filling evenly throughout dough leaving a 1/2 inch margin along the bottom. Begin rolling up dough into a log starting from the farthest end bringing it in towards you. Roll up as tightly as possible. Brush bottom end with some water to help seal the roll once finished rolling. Take log and cut into 15 equal pieces. Transfer to parchment lined pan placing rolls side by side to prevent excessive spreading and cover with plastic. Place in a warm area to rise until doubled in size, about 45 minutes to 1 hour. While rolls are rising preheat oven to 350F. When ready to bake brush tops of rolls with egg wash and place in oven. Bake until lightly browned but still soft, about 20 minutes. Made these this a.m. and they were fantastic, I have been cooking gluten free for 17 years and this is the best bread flour I have used! LOVE this recipe! We used it as a springboard for our vegan and gluten free cinnamon rolls. Life changing dough THANK YOU!